As outlined in the project white paper one of the utility cases for LEDU tokens in Education Ecosystem is rewarding community moderators for their work with LEDU. This article explains how the LEDU community moderation bounty program works. Community mods on Education Ecosystem can be viewers or conduct quality assurance checks and run Zendesk customer support. A community mod will spend about 10 – 15 hrs per week supporting the ecosystem. The work involves supporting other users in the community and quality assurance. Quality assurance encompasses reporting bugs, technical streaming issues, video quality issues, and content moderation. 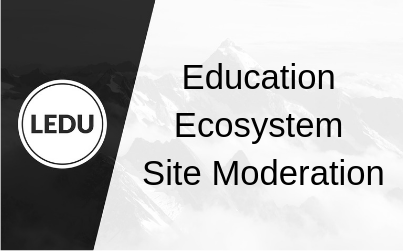 Interested community members who want to support Education Ecosystem as community moderators can apply to join the program by sending email to Dusan at “[email protected]”. After an application is received qualified applicants will be interviewed and then notified if they are selected. Moderators run random quality checks on the Education Ecosystem learning platform. A Quality Assurance (QA) sheet is provided to moderators which they can fill in and report any issues found. If other issues are found they can also be reported by the moderator. These issues are then double checked by our quality assurance team. We use a Slack group for organizing the community moderation work. Site moderators will be rewarded 44000 LEDU tokens each month. Site moderator performance is evaluated monthly and a moderator must maintain active status to continue receiving LEDU rewards.